Kim Dellow - Page 186 of 190 - Mixed media art inspiration and videos. I have just discovered walnut stain distress ink from Tim Holtz and I LOVE it! 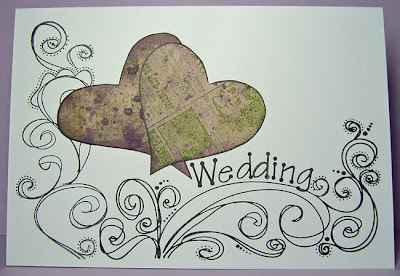 Wow, it is just fab to use to distress papers. 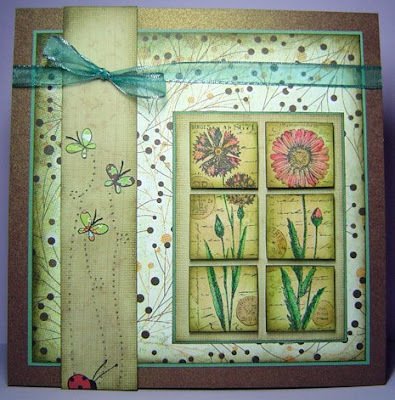 So having a play with the walnut stain, I did this card with the fab sketch from Stamp Something (just got it done in time for the challenge – again) using the Nature theme from Arty Girlz. Thanks guys for the great inspiration. Do you like the inches? Well, truth be told, they are slightly bigger than inches but just by a touch. The little butterflies and ladybird are stamped and cut from patterned paper and I’ve used some paper piercing for the butterfly trails. The paper used was from Basic Grey (edged with walnut stain of course!) and the main stamp is a Crafty Individuals stamp. Here is a card using brown and turquoise, one of my favourite colour combinations. The card uses the fab sketch from Katharina’s Creative Place and I thought I would also use some check paper, which is the theme over at A Spoon Full Of Sugar. The stamp is a Sugar Nellie from the Little Cotton Rabbits Range and one of my favourites. The papers were free from Papercraft Essentials. This week’s challenge on Think Monday – Think ATC is ‘tickets’. So I’ve made this ATC from some train tickets, screwed up and coloured with alcohol inks. The dot texture at the top was made with sticky dots removed from the card and then the blank spots were wiped with the alcohol ink. 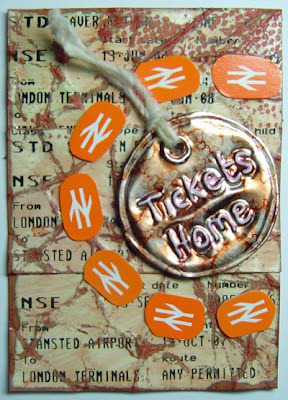 The tag was made from metal and again coloured with alcohol ink and says ‘Tickets Home’. A strand of wool and the National Rail logo for trains in Britain finish this ATC. Thanks, Jacqueline, for the chance with your fab blog candy… Go have a look at Creja Kaarten for a chance at some fab giveaways. 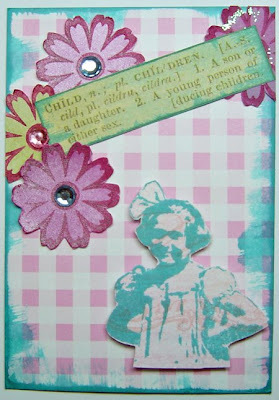 Here is a children theme ATC for Lots To Do Challenge. I kinda love the pink gingham with the turquiose ink colours. There is some fab blog candy up on Enjays Craft Pages, celebrating 11,000 hits – well done! So the papers come from freebies from Papercraft Essential, I’ve cut out all the flowers so that I could re-arrange them on the page. The stamp is Chef Hamish from Sugar Nellie coloured with watercolour pens. The sentiment is written in the flower using a white Sakura pen. Celebrating a new birth in Lemon and Lime – what do you think? 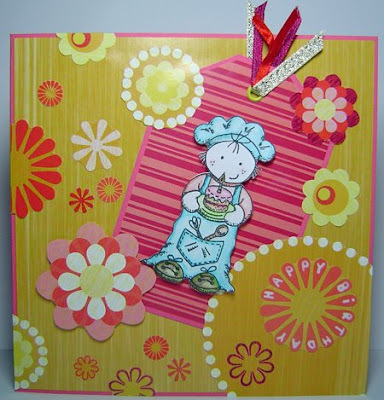 This card was made for the following challenges: the celebration theme from A Spoon Full of Sugar, the great sketch from Friday Sketchers, the Baby theme on Thank God it’s Friday and the new challenge blog This Thursday It’s About which is starting with the theme ‘Fresh’. I’ve been sampled twice for this one. Thanks guys 🙂 This Thursday, It’s All About and Thank God It’s Friday. Here is a card for two challenge blogs. 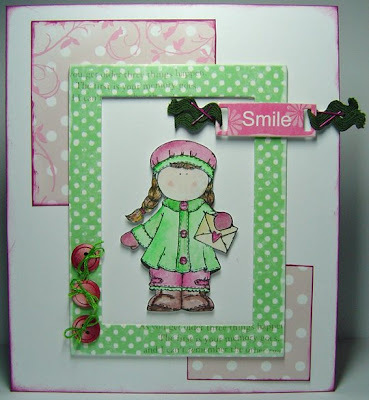 One is Cute Card Thursday (so just managed to make it in time) where the challenge is to have three embellishments. I’ve used three buttons to embellish the frame. Then the other blog is My Time To Craft which has a Buttons and Buckles theme. The buttons are counterbalanced with a sentiment ‘buckle’ finished with rick rak and pink staples. 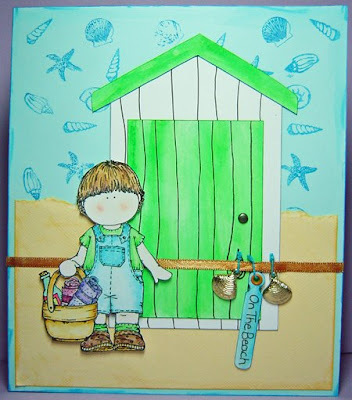 The stamped image was coloured using a mix of watercolour pencils and Marvy Le Plume pens and the chipboard frame and sentiment buckle were from Dovecraft. The paper and card was edged with a deep pink ink pad.